John Deere has developed an electric cable powered tractor developing up to 400hp. The GridCON research project and tractor are part of the company’s continued efforts in the electrification of agricultural machinery, offering new opportunities for farms to supply and use their own energy. John Deere presented the first fully electric tractor, known as the SESAM (Sustainable Energy Supply for Agricultural Machinery), in 2016. The GridCON tractor looks very different to its predecessor, as it features no cab and no rows of batteries underneath the bonnet. It is the first vehicle to be fully electric, permanently cable powered and capable of fully autonomous operation in the field. 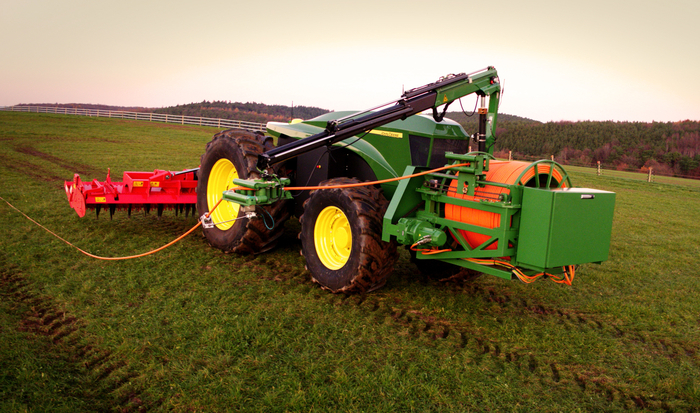 Based on a John Deere 6210R tractor, GridCON utilises a cable connection from the field border to the machine, which transfers power continuously at over 300kW. A 100kW electric motor powers the IVT transmission, and there is an additional outlet for implements powered by a 200kW electric motor. A power supply of 2.5kV AC is required, and the GridCON tractor uses a 700V DC bus for electric power distribution both onboard and for implements. The machine employs a cooling infrastructure for off-board electrical use, whiletotal efficiency of the drivetrain is in the region of 85 per cent. Total empty weight of the working prototype GridCON tractor including cable drum and robot arm is about 8.5 tonnes, so it is about the same weight as a conventional John Deere 6195R tractor but with twice as much power.Research engineers are aiming to reduce the weight further by at least one tonne.